Our most popular Flag Banner, simply because it works. 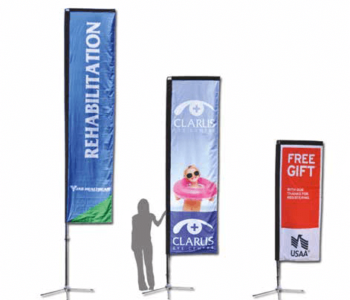 The Fly Flag Banner, commonly referred to as a tear drop banner, is the most popular type of banner signage used in retail. Market-tested and proven to be highly effective, this banner system is known to dramatically increase foot traffic to retail stores. The Fly Flag Banner is available in 3 sizes – 8ft, 11ft and 14ft in height, with single or double-sided sleeves. Each Fly Flag Banner comes with an easy to assemble modular pole set, fabric sleeve, custom carry bag and a ground stake stand. or service. Feather Flag Banners have an elegant shape. Great for indoor trade shows and outdoor events. The Feather Flag Banner is available in 3 sizes – 8ft, 11ft and 14ft in height, with single or double-sided sleeves. Each Feather Flag Banner comes with an easy to assemble modular pole set, fabric sleeve, custom carry bag and a ground stake stand. The Sail Flag Banner is an elegant and functional modification of the Feather Flag Banner. This banner system utilizes a horizontal arm that creates a large graphic area for maximum visibility. We named this banner for its ability to rotate or “sail” in the wind, thus ensuring its graphics will always be visible from any angle. The Sail Flag Banner is available in 2 sizes – 8ft and 11ft in height, with double-sided sleeves only. Each Sail Flag Banner comes with an easy to assemble modular pole set, fabric sleeve, custom carry bag and a ground stake stand. The Shark Fin Flag Banner is the newest banner in our Flag Banner range. 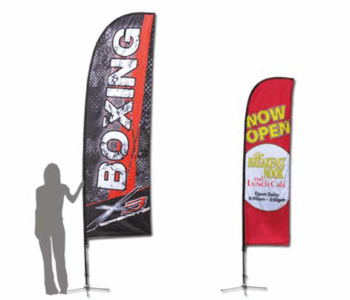 This larger option to the Fly Flag Banner is more visible and provides more space for your message than other outdoor banners. 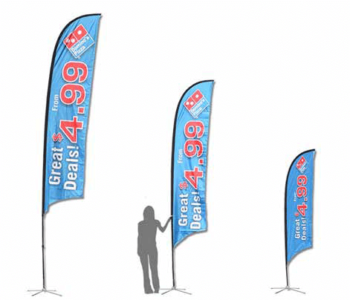 The Shark Fin Flag Banner is available in 3 sizes – 9ft, 12.5ft and 15.5ft in height, with single or double-sided sleeves. 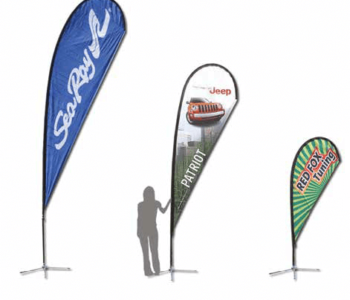 Each Shark Fin flag banner comes with an easy to assemble modular pole set, fabric sleeve, custom carry bag and a ground stake stand.